What Does a Weighted Blanket Do? 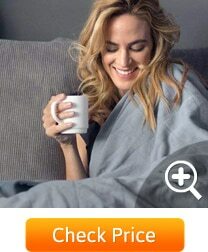 Should I Buy A Weighted Blanket On Amazon? Why are Glass Beads Better? It feels like no matter what you do, you just can’t get comfortable and fall asleep! Your mind is racing with stress and anxiety and your body feels restless and uncomfortable. As you lie there tossing and turning, you contemplate sleeping pills, drugs and even the meaning of life itself! It feels like you’re going insane! Thankfully, there’s an incredibly effective (and completely natural) way to cure insomnia and sleep anxiety without the need for sleeping pills or other drugs. A specifically designed Weighted Blanket for anxiety and other sleeping disorders! A weighted blanket (also known as a pressure or sensory blanket) is a specially weighted comforter with compartments filled with a material like tiny glass beads, plastic pellets or other organic compounds. The added material increases the overall weight while the sewn-in compartments keep contents in place. The weight of the blanket is evenly distributed and forms and even distributed weight around your body as you drift into a deep sleep. This simple but effective solution tricks your body into feeling like it’s being “swaddled” like a baby while the pressure pushes down evenly and comfortable on your muscles and your skin. It’s a kind of Deep Pressure Therapy which increases serotonin & melatonin into your body and feels like being cuddled or hugged while sleeping. 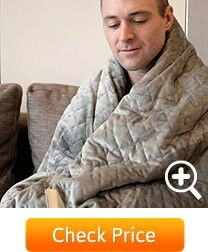 If you’re looking for an affordable, high quality weighted blanket that does exactly what it says without any fancy frills, this is the one! The increased ratio of glass beads to fiber filling allows for better temperature control while still creating the swaddling effect. 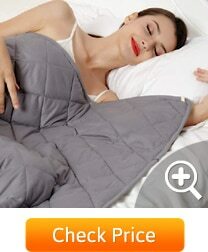 This makes it a great cooling weighted blanket for host sleepers. There are Twin, Queen and King Size options ranging from 12 to 25 pounds, so you can buy the absolute perfect fit. The stitching on the seams as well as the material itself is of a very high quality. (This is essential as you don’t want little glass beads all over your bed.) Should you experience any “leaking”, the manufacturer will sort it out with no questions asked. This is an inner “duvet” and doesn’t include an outer cover. Fortunately, this allows you to pick your own style of cover from a variety of materials. 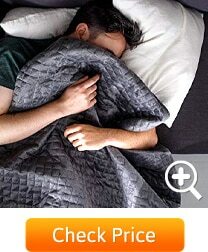 If you’re a hot sleeper, you should buy the cool YnM cotton cover (sold separately). If you’d rather be super snug, consider warmer materials like velvet or micro-fleece. What we love most about this Quility are the removable Minky covers available in Grey, Navy or Ivory. (There are optional brushed Cotton options as well.) The Minky has super soft studs spread over the surface to add to the plush feel of the material. As with most options on the list, the hypo-allergenic glass beads are securely packed inside dedicated “pockets” which have been sewn together with high-quality stitching. It’s incredibly well priced for the level of quality and the fact that it includes a cover makes it a bargain! The Minky feels very soft to the touch and ads to the calming effect of the overall blanket. Unfortunately, the Minky cover can sometimes quite feel warm and you should be considering the cotton covers is you’re a hot sleeper. The ultra soft removable Minky cover is the softest on the entire list. It honestly feels like Cashmere and is absolutely perfect for colder environments. The inner is flawlessly stitched and into 6” squares, keeping all the glass beads perfectly in place while you sleep. The quartz glass beads are heavier than normal glass making it the thinnest blanket for its weight. This is perfect for allowing movement while still offering even pressure throughout. Unfortunately, they aren’t available in any sizes other than 60”x80” so you’ll need to be sure you’re grabbing the correct size for your bed. It has by far the highest “snuggle” rating on the list. The massive 80×87 weighted blanket goes up to 30 pounds! Considering you should be choosing 8-12% of your body weight, this is ideal for folks of about 240 pounds and up. You may want to extra weight if you’re particularly bothered by restless legs syndrome or twitching muscles at night. The bead pockets are stitched in a 4”x4” diamond pattern, resulting in the most evenly spread weight distribution of all the options. It also includes a diamond stitched hypoallergenic, breathable 100% cotton cover. Don’t pick this option if you only have a queen size bed. It’s huge and is meant for King or Cal King. A weighted blanket for adults should never really hang over the sides of your mattress. It will make it harder to move as the weight will compound when it hangs over the edge of the bed. That being said, the quality is pretty good. The stitching is fine and the beads are the same glass beads you’ll find on some more expensive models. If you do find some of the stitching coming loose, you have 30 days no questions return policy and a 3 year warranty. This is where it all started… the Original Gravity Blanket. It’s the first widely known weighted blanket and really took advantage of a huge growing trend. The velvety microfiber duvet cover is soft to the touch and will add just a little bit of luxury to your sleep. They only come in a 48×72 inch size. This means that only one person will benefit from the gravity blanket at a time. The weighting material is made of plastic pellets (not glass beads as per the others on the list) which are somewhat lighter than glass. This means that the overall thickness is slightly more to compensate for the lowered weight ratio. How do weighted blankets for anxiety actually work? Is it some magic hocus-pocus or is there really something behind the science? You feel less anxious. Natural endorphins are released into the bloodstream as you lie under the cloud of pressure, allowing your mind to “let go” of some of the stresses you’re dealing with. You feel safer. 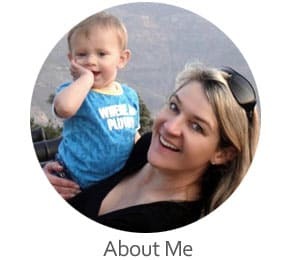 Your nervous system feels the soothing comfort of the weight and believes it to represent safety and security on a primitive, subconscious level. It has helped many people deal with Sleep Anxiety and Insomnia as well as Restless Legs Syndrome and even Adult Autism, ADHD and other related sensory disorders. You fall asleep faster. With the physiological and psychological benefits, you simply become more inclined to fall asleep without the tossing and turning. This, in turn, leads to less anxiety over falling asleep for the following evening, until it’s simply no longer a problem for you. You sleep much better. During the night, you sleep deeper and are much less bothered by outside disturbances. This means a lower chance of waking in the night. It’s much healthier to sleep undisturbed AND you rise in the morning feeling fantastic! The blanket should be around 8-12% of your body weight. Higher quality options use glass beads instead of plastic or organic materials like rice, beans or sand. Glass has a higher weight/size ratio, making the blanket heavier while remaining thin and easier to adjust while you sleep. By far the most convenient way to buy is online. The wonderful thing about Amazon, besides lightning fast delivery and great prices, is the fact that you can return your items if you are unhappy with them. Their returns policy is very helpful and makes it easier to commit to something you’ve never seen in person. Such is the case with a weighted blanket… You haven’t necessarily seen the product you’re buying and can never be 100% sure it’s what you want, until you’ve actually had it in your possession. If you find yourself unhappy with the product in any way, simply return it for a full refund. Getting used to sleeping with a weighted blanket can be tricky at first. Some people want their body swaddled but their feet completely free. Others prefer their arms outside. It really is up to personal preference. Thankfully, you’ll get used to it very quickly and it’ll be 100% worth it. The blanket is not designed to go over the edges of the bed and should fit the mattress a closely as possible. If too much hang over the side of the bed, you’ll find it more and more difficult to move around, as the hanging weight compounds. Because it’s much heavier than a normal blanket, you’ll find that making your bed takes some energy. You’ll find it much easier to have two people doing the job. Washing instructions will vary per manufacturer. Some are machine-washable and can be gently tumble dried. In some (2 piece sets) cases you may need to remove the outer duvet cover and wash it separately, while the inner comforter should always be washed by hand only. There are two main reasons why you should be choosing glass beads over plastic, sand, rice or beans. They are heavier for their size, so you’re blanket can be thinner while still being as heavy as needed. They also make less noise when moving around compared to other materials. They have a great returns policy and the pricing is often lower than in physical retail stores. In most cases, the product is delivered to your door within a day or two, so you cut out the hassle of “hunting” it down in a crowded shopping mall.